So, how does the Halal Movement plan to achieve such a lofty goal? They are doing it in the time-honored way of any crime syndicate, like Mob boss Al Capone with extortion for “protection money” or the “pay-to-play” schemes of Jesse Jackson and his son, Jesse Jr. 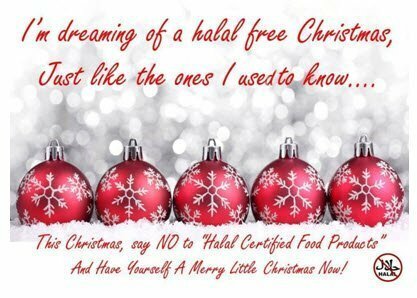 Through the Halal certification movement, you must obtain the proper seal of approval before you can sell products that are acceptable to Muslims. There are many certification bodies and some of them are headed by criminals out to make a quick buck without any actual certification protocol. Where does the money go? Into the pockets of the certifiers. There are hundreds of certifiers and some of them have connections to Muslim Brotherhood front groups. At the very least, these Muslim certifiers pay their annual Zakat [annual obligatory charity] and we know that part of it is slated to go toward jihad. So, the consumer of these products pays for jihad and at a higher price because producers need to make up for the money lost by paying hefty certifying fees. This is the ultimate play “pay-to-play” scheme. You might think that it does not concern you. Let the Muslims eat their own food as you would never buy it. You know that animals in a Muslim slaughterhouse are often killed in a way that means they die an agonizing death as they bleed out. You don’t want to consume meat that has been flooded by stress hormones at the time of death, and you don’t want to consume food that has been prayed over by an imam who gives blessings to Allah. But, wait. Maybe you are consuming Halal food without knowing it. Maybe it is already in your child’s lunchroom or sold at your corner market. Maybe the neighborhood diner with the great lunch menu serves Halal food. How would you know? Halal is not always clearly identified. And the tiny little Halal certification seal is not discovered on food packaging unless you are making a point of looking for it under close scrutiny. At this stage, the push is not so public with a marketing campaign to accept Halal or even prefer it. That is coming. This is just another advancement in the stealth invasion for global conquest. The main push now is two-pronged. 3. To ensure everything is Halal with no cross-contamination with the non-Halal or the Haram. As you can see, the plan is for a well-integrated system with no openings for outsiders. The movement is toward a global model with Malaysia at the hub. Halal industrial parks are being created and the move is to create more links in the supply chain. These potential links are presented to Muslim entrepreneurs as opportunities for the vast profits a multi-trillion-dollar global industry holds for them. It all fits in with “Tawid”, an Islamic doctrine at the forefront of Islamic thought today because it concerns the union of all Muslims that see they have been fragmented by colonialism and nationalism. Tawid is a powerful symbol of union for the entire Islamic community. It goes beyond borders. It is the ultimate unifier of Muslims the world over and what can be more unifying than putting the entire globe under the Halal umbrella? If you don’t want Halal for everyone what should you do? Become an activist: Boycotts? Awareness Campaigns? It is up to all of us to get involved. Think of the best way you can help.